The Cambium Networks cnPilot™ e430H enterprise class indoor wall plate access point supporting 802.11ac Wave 2 standards based beamforming, is perfect for hotels and resorts, multi-dwelling units (MDUs) or just about any place indoor that needs a wall mounted AP with multiple Gig E ports to drive indoor Wi-Fi and wired port network access managed via portals. The cnPilot e430 Enterprise class Indoor Wall Plate access point supporting 802.11ac Wave 2 standards based beamforming, is perfect for hotels and resorts (Hospitality) and multi-dwelling units (MDUs). The e430H supports network wide seamless roaming for up to 1,000 clients. Host the hotspot portal on the AP for controller-less simplicity, or on cnMaestro for a powerful network wide portal. Monetize your Wi-Fi service: cnMaestro’s guest access feature supports splash page hosting, social login and payment gateway for wired and wireless clients. Built-in power packed features available right on the controller. These features along with the ability to create time, rate and volume limited traffic profiles along with vouchers for temporary guest access makes the e430H ideal for hotels, coffee shops, campgrounds, and office guest Wi-Fi. Service Aware WLANs. Better User Experience. Nothing is more frustrating than connecting to an AP, but not getting to the internet because the WAN link is down. When connection to a critical resource such as an external Gateway or AAA is down, the e430H monitors the uplink Gigabit interface for network outage. If an outage is detected, the impacted WLANs are disabled enabling client devices to select a neighboring AP. 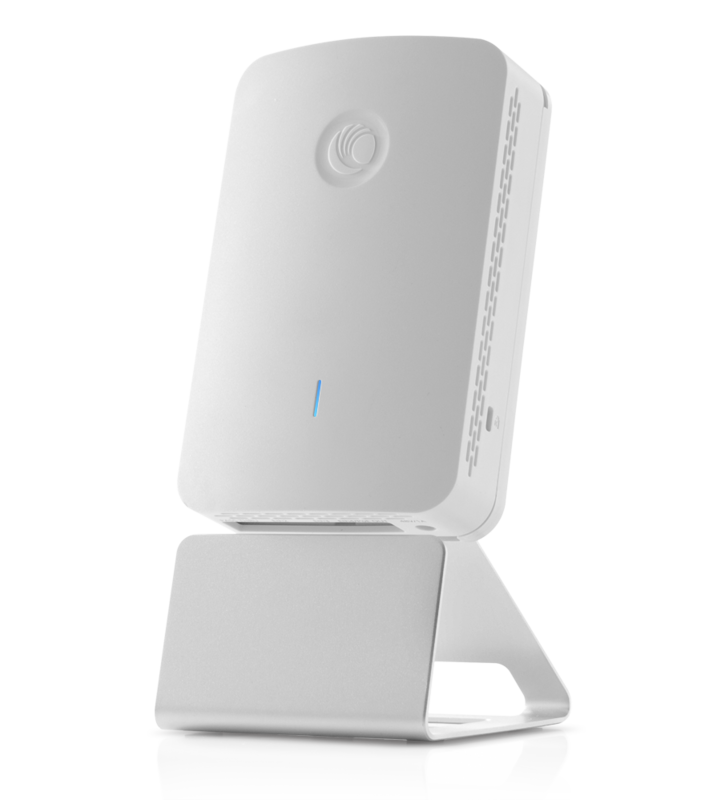 Indoor meshing across multiple e430Hs or indoor/ outdoor meshing across the e430H indoor and an outdoor Cambium Networks APs (like the e500) offers a convenient way to easily expand Wi-Fi coverage without wires. The e430H packs strong transmit power and the flexible controls needed to control transmit power for high density deployments. Throughput management via airtime fairness, increased performance from automatic channel scanning (ACS), and higher client device speeds from band steering ensure your e430H network can adapt to the dynamics of ever changing client profiles. A capacity of 256 max concurrent client associations, and 16 SSIDs, along with dual on-board Active/Standby memory banks ensure the e430H combines high density with high availability. All cnPilot access points offer total management flexibility. The e430H can be managed as a standalone access point, from an on-premises cnMaestro controller, or a cloud accessed cnMaestro account. cnPIlot access points even support AutoPilot, allowing one access point to become a controller for a small network with all the advantages of a controller and none of the effort, time or cost.